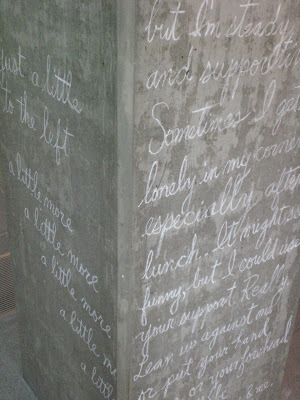 I spent my afternoon making chalk poems on the columns at the heads of the stairs, level 2 and 3. The day before, I’d printed a few articles on columns and looked up famous columns in history. 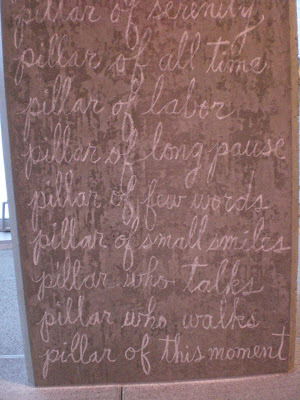 At first, I was waiting to know more about columns, about these columns, but then I realized I had the chalk and I had the ladder and the only way to get to know a column is to go up to it and say hello to it. The result was, I think, about my relationship to the whole, that is to say the column’s relationship to the building or the associate’s relationship to the firm. 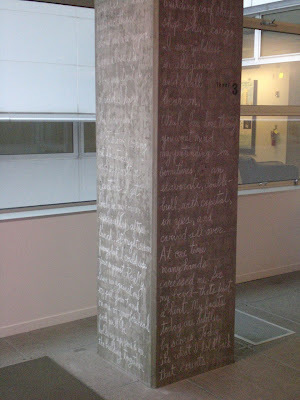 If the free space owes itself to the column, the free space ought to ask it, How are you feeling? I see you. I rest a hand on you. What do you desire? A moment? A moment like this? In the morning, I attended a Studio 5 meeting. I wish I’d brought William Carlos Williams’ poem, The Great Figure, inspired by Charles Demuth’s painting The Figure 5 in Gold. They would have liked it. Studio 5 is the healthy group of professionals who meet under the stage on the south side of Level 2 every Monday morning. Their work is 90% health care and they seem to get a lot of work. I read The Cucumber by Nazim Hikmet to them. With all the rain and lack of color, it seemed crucial to bring a thing of color into the room, to imagine how it might transfix us and color the air. After my reading, someone recalled "Bring Your Dog to Work Day" and smiled, remarking on the poet-in-residence, "It’s an interesting place, NBBJ!" this was a pretty cool project...i hope they didn't erase them! and i'm glad that the guys at studio 5 got the poem you read, or at least made them think about the relationship between a moment of poetry and their place in the work environment...how one could incorporate itself with the other, how an image can brighten up a day...keep on rowing Mimi!